last city escaping his control, Chengdu, surrendered to his army. 2. Literally meaning "continuator and martial". Emperor Guangwu (January 15, 5 B.C.E. - March 29, 57 C.E. ), born Liu Xiu, was an emperor of the Chinese Han Dynasty, restorer of the dynasty in 25 C.E. and founder of the Later Han or Eastern Han (the restored Han Dynasty). He ruled over the whole of China from 36 until 57. Liu Xiu was one of the many descendants of the Han imperial family. Following the usurpation of the Han throne by Wang Mang and the ensuing civil war during the disintegration of Wang's short-lived Xin Dynasty, he emerged as one of several descendants of the fallen dynasty claiming the imperial throne. After assembling forces and proclaiming himself emperor in the face of competitors, he was able to defeat his rivals, destroy the peasant army of the Chimei (Red Eyebrows, 赤眉), known for their disorganization and marauding, and finally reunified the whole of China in 36 C.E..
His military campaigns featured many able generals, but lacked major strategists. He often instructed his generals as to strategy from afar, and his predictions were generally accurate. Emperor Guangwu's reign was marked by thriftiness, efficiency, and laxity of laws, and laid the foundation for the 200-year rule of the later Han Dynasty. Liu Qin married the daughter of Fan Chong (樊重), and the couple had three sons, Liu Yan (劉縯), Liu Zhong (劉仲), and Liu Xiu, born January 15, 5 B.C.E.. Liu Qin died early, and the brothers were raised by their uncle Liu Liang (劉良). Liu Yan, the eldest, was ambitious, and ever since Wang Mang usurped the Han throne in 8 B.C.E., had been plotting a rebellion to restore the Han Dynasty. Liu Xiu, in contrast, was a careful man who was content to be a farmer. However, his brother-in-law Deng Chen (鄧晨), the husband of his sister Liu Yuan (劉元), who believed in a prophecy that a man named Liu Xiu would be emperor, constantly encouraged him to be more ambitious. In 22, when Wang Mang’s incompetency as a ruler had aroused rebellions in many parts of the empire, Liu Yan prepared a plan, along with his brothers, and Li Tong (李通) and his cousin Li Yi (李軼), to kidnap the governor of Nanyang Commandery (roughly modern Nanyang, Henan) and call for the people of the commandery to join him. The young men of their home territory of Chongling were reluctant to join the revolt until they saw that such a careful man as Liu Xiu was part of it, and gained confidence that the rebellion was carefully planned. News of the plan leaked out; Li Tong and Li Yi barely escaped with their lives, and their family was slaughtered. Liu Yan changed his plan and persuaded two branches of the Lülin , the Xinshi Force (新市兵) and Pinglin Force (平林兵) to join forces with him. Encouraged by some minor military successes, Liu Yan made a frontal assault against Wancheng (宛城), the capital of Nanyang Commandery, and suffered a major loss. Liu Yan and Liu Xiu, and their sister Liu Boji (劉伯姬), survived, but their brother Liu Zhong and sister Liu Yuan died in the battle. Liu Yan's allies considered leaving him, but Liu Yan was able to persuade them, along with another branch of the Lülin, the Xiajiang Force (下江兵), to press forward. In 23, they won a major victory against Xin forces, killing Zhen Fu (甄阜), the governor of Nanyang Commandery. By this time, some of the rebel leaders had become jealous of Liu Yan's capabilities, and did not want to make him the emperor of a newly declared Han Dynasty. Instead, they supported another local rebel leader, Liu Xuan, a third cousin of Liu Yan, who had claimed the title of General Gengshi (更始將軍) and was considered to have a weak personality. Liu Yan initially opposed this move, suggesting that Liu Xuan first be given the title "Prince of Han," like the founder of the Han Dynasty, Emperor Gao. The other rebel leaders refused, and early in 23, Liu Xuan was proclaimed emperor. Liu Yan became prime minister, and Liu Xiu, along with many other rebel leaders, were given the title of "general." Emperor Wang, aware that Emperor Gengshi was becoming a major threat, sent his cousin Wang Yi (王邑) and his prime minister Wang Xun (王尋) with what he considered to be overwhelming force of some 430,000 men to crush the newly constituted Han regime. The Han forces were at this point in two groups, one led by Wang Feng (王鳳), Wang Chang (王常), and Liu Xiu, which, in response to the arrival of the Xin forces, withdrew to the small town of Kunyang (昆陽, in modern Pingdingshan, Henan); and one led by Liu Yan, which was still besieging Wancheng. Initially, the rebels in Kunyang wanted to scatter, but Liu Xiu advocated that they hold Kunyang securely, while he gathered all other available troops from surrounding areas and attacked the Xin forces from behind. The Kunyang rebels eventually agreed. Liu Xiu gathered his forces, returned to Kunyang, and began harassing the besieging Xin forces from the outside. Wang Yi and Wang Xun, annoyed, led 10,000 men to attack Liu Xiu and ordered the rest of their troops not to move from their siege locations. Once they engaged in battle and suffered minor losses, however, the other units were hesitant to assist them, and Liu Xiu killed Wang Xun in battle. The rebel Han forces inside Kunyang burst out of the city and attacked the other Xin units, and the much larger Xin forces suffered a total collapse. Many of the soldiers deserted and went home, and Wang Yi had to withdraw with only several thousand men back to Luoyang. This was a major psychological blow form which the Xin Dynasty never recovered. Emperor Gengshi was fearful of Liu Yan's capabilities and keenly aware that many of Liu Yan's followers were angry that he was not made emperor. When one of them, Liu Ji (劉稷), who was particularly critical of Emperor Gengshi, was arrested and threatened with execution, Liu Yan tried to intercede. Emperor Gengshi, encouraged by Li Yi (who had by that point turned against Liu Yan) and Zhu Wei (朱鮪), took this opportunity to execute Liu Yan as well. When Liu Xiu, who was fighting on the front lines, heard of his brother's death, he quickly left his army and went back to the temporary capital Wancheng to beg forgiveness. When Liu Yan's followers greeted him, he thanked them but did not speak of his feelings, blaming himself, and did not mention his achievements at Kunyang. He did not dare to mourn his brother. Emperor Gengshi, ashamed of what he had done, spared Liu Xiu and created him the Marquess of Wuxin. Wang Mang's Xin Dynasty and its capital Chang'an soon fell to Emperor Gengshi's forces, and Emperor Gengshi was acknowledged by virtually the entire empire as the emperor of the restored Han Dynasty. Emperor Gengshi initially planned to make Luoyang his capital, and he made Liu Xiu governor of the capital region. Liu Xiu was commissioned to repair the palaces and governmental offices at Luoyang, and quickly demonstrated his talent for organization. Emperor Gengshi's regime was only able to obtain nominal submission from many regions of the empire, including the region north of the Yellow River. In spite of opposition from Liu Yan's political enemies, in the autumn of 23, Emperor Gengshi sent Liu Xiu to the region north of the Yellow River. He was initially welcomed there, but in the winter of 23, a fortuneteller in Handan, claimed to be a long-lost son of Emperor Cheng of Han named Liu Ziyu (劉子輿), and the commanderies north of the Yellow River quickly pledged allegiance to him as emperor. In the spring of 24, Liu Xiu was forced to withdraw to the northern city of Jicheng (薊城, in modern Beijing). Several times was nearly killed by rebels who pledged allegiance to Wang. He reached two commanderies in modern central Hebei that were still loyal to Emperor Gengshi, Xindu (信都, roughly modern Hengshui, Hebei) and Herong (和戎, roughly part of modern Shijiajuang, Hebei), mobilized their forces, and won some major battles against Wang's generals. One of Liu Xiu’s followers, Geng Yan (耿弇), the son of the governor of Shanggu Commandery (上谷, roughly modern Zhangjiakou, Hebei), persuaded both his father Geng Kuang (耿況) and the governor of the neighboring Yuyang Commandery (漁陽, roughly modern Beijing), Peng Chong (彭寵), to support Liu Xiu. Geng Yan and Peng's deputy, Wu Han (吳漢), led the two commanderies' cavalry and infantry forces south to join Liu Xiu. The combined forces gave Liu Xiu enough strength to make a direct assault against Handan, trapping and killing Wang Lang. After Wang's death, Emperor Gengshi created Liu Xiu the Prince of Xiao and summoned him back to the capital, which had been moved to Chang'an. Liu Xiu, aware that the people were discontented with the misrule of Emperor Gengshi and his officials, was persuaded by his advisor Geng Yan that he should prepare to set out on his own course, and declined, claiming that the region still needed to be pacified. In autumn 24, Liu Xiu, still ostensibly an official under Emperor Gengshi, successfully pacified some of the larger agrarian rebel groups and merged them into his own forces. He also started replacing officials loyal to Emperor Gengshi with those loyal to himself. He consolidated his power north of the Yellow River and, as waited for the powerful Chimei (Red Eyebrows, 赤眉), to destroy Emperor Gengshi's government. He put Kou Xun (寇恂) in charge of the Henei (modern northern Henan, north of the Yellow River) region and made it the base for food and manpower supplies, and sent Deng with an expedition force to the modern Shaanxi region. In early 25, Deng, on his way west, seized the modern Shanxi region and put it under Liu Xiu's control, before crossing the Yellow River into modern Shaanxi. Liu Xiu now controlled more territory than any other regional power in the empire, and in summer 25, after repeated urging by his followers, he finally claimed the title of emperor and the right to succeed to the Han throne as Emperor Guangwu. Soon after Emperor Guangwu's ascension, Emperor Gengshi's regime was destroyed by the Chimei, who supported their own pretender to the Han throne, Emperor Liu Penzi. The Chimei leaders soon alienated the people of the Guanzhong (關中, modern central Shaanxi) region, which they had taken over when they overthrew Emperor Gengshi. They pillaged the Guanzhong region for supplies, but as supplies ran out, they were forced to withdraw east in an attempt to return home (modern Shandong and northern Jiangsu). Anticipating this, Emperor Guangwu set up his forces to harass and exhaust the Chimei, and then block their retreat at Yiyang (宜陽, in modern Luoyang, Henan). The Chimei leaders surrendered, and Emperor Guangwu spared them, including their puppet pretender Emperor Penzi. Liu Yong (劉永), also claiming to be the proper emperor of Han, based on his lineage—as the son of Liu Li (劉立), the Prince of Liang under the reigns of Emperor Cheng, Emperor Ai, and Emperor Ping who had been forced by Wang Mang to commit suicide; he controlled the modern eastern Henan and northern Jiangsu region. Peng Chong, who had been by this point aggravated by Emperor Guangwu's official Zhu Fu (朱浮) into rebellion (in a rare case of a succession of wrong decisions by Emperor Guangwu—mistakes that he learned from and would not repeat); he claimed the title of the Prince of Yan and controlled the modern Beijing region. Zhang Bu (張步), nominally the Prince of Qi under Liu Yong, but who independently controlled the modern Shandong region. Wei Xiao (隗囂), nominally the commander of the Xizhou (西州) region paying allegiance to Emperor Guangwu, but who independently controlled the modern eastern Gansu region, east of the Yellow River. Dou Rong (竇融), nominally the governor of Liang Province (涼州) paying allegiance to Emperor Guangwu, but who independently controlled the modern western Gansu and northern Qinghai region, west of the Yellow River. Lu Fang (盧芳), who also claimed the name Liu Wenbo (劉文伯) and claimed to be a descendant of Emperor Wu and the proper Han emperor. He, supported by Xiongnu's Chanyu Yu (輿), controlled the modern central and western Inner Mongolia region. Gongsun Shu's empire of Chengjia was wealthy and powerful, but Gongsun was content to maintain his regional empire and not carry out any military expeditions outside his empire. By 30, the other regimes had either collapsed or surrendered, and all of eastern China was under Emperor Guangwu's rule. Wei, seeing that Eastern Han was gradually unifying the empire, tried to persuade Dou to enter into an alliance with him to resist Eastern Han, but Dou refused. When Eastern Han started considering conquering Chengjia, Wei, apprehensive of the implications of Chengjia's fall, tried to persuade Emperor Guangwu not to carry out a campaign against Chengjia, and later refused to lead his forces south against Chengjia. Emperor Guangwu, who preferred peaceful resolution, repeatedly wrote both Wei and Gongsun in humble terms, promising them titles and honors if they submitted to him. In the summer of 30, Emperor Guangwu started a campaign against Wei, assisted by Wei's friend Ma Yuan, who had served as Wei's liaison officer to Emperor Guangwu and had tried in vain to persuade him not to take the course of independence. In response, Wei formally submitted to Gongsun and accepted a princely title, Prince of Shuoning, from him. Attacked by the combined forces of Dou and Emperor Guangwu, Wei's small independent regime eventually collapsed. In 33, Wei died and was succeeded by his son Wei Chun (隗純). In winter 34, Shuoning's capital Luomen (落門, in modern Tianshui, Gansu) fell, and Wei Chun surrendered. Emperor Guangwu then turned his attention to Chengjia. He commissioned his generals Wu Han, Cen Peng (岑彭), Lai She (來歙), and Gai Yan (蓋延) to make a two-pronged attack on Chengjia: Wu and Cen leading an army and a navy up the Yangtze river from modern Hubei, while Lai and Gai led an army south from modern Shaanxi. Instead of fighting the Eastern Han expedition on the battlefield, Gongsun tried to repel them by assassinating their generals. He was initially successful, assassinating Cen and Lai and temporarily causing the Eastern Han forces to halt. However, Eastern Han forces regrouped, and in 36 they had besieged Gongsun in his capital Chengdu (成都, modern Chengdu, Sichuan). Initial attempts to take the city was unsuccessful, and Wu, then in command of the expeditionary force, considered withdrawing. Persuaded by his lieutenant Zhang Kan (張堪) that Gongsun was in desperate straits, however, Wu pretended that the Eastern Han forces were collapsing from fatigue, drawing Gongsun out of the city to engage him in battle. Gongsun was mortally wounded, and Chengdu surrendered in winter 36. After Chengjia's fall, Dou turned over the lands under his control to Emperor Guangwu in 36, and was made prime controller. Lu, who had initially submitted to Emperor Guangwu and been made the Prince of Dai, rebelled again unsuccessfully and fled to Xiongnu in 42. The empire was entirely under Emperor Guangwu's rule. Although Emperor Guangwu had already created many of his generals and officials marquesses, in 37, after the conquest of the empire was largely complete, he readjusted their marches in accordance with their accomplishments. In order to preserve good relationships with his generals and protect their titles and positions, he decided to give the generals large marches but not give them official positions in his government. He rewarded them with great wealth and often listened to their advice, but rarely put them in positions of authority. Guangwu established his capital in Luoyang, 335 kilometers (210 miles) east of the former capital Chang'an, ushering in the Later (Eastern) Han Dynasty. He implemented reforms intended to correct some of the structural imbalances responsible for the downfall of the Former (Western) Han. Emperor Guangwu's reign was marked by thriftiness, efficiency, and laxity of laws. For example, in 38, Emperor Guangwu rejected a petition submitted by the official Liang Tong (梁統) to restore the severe criminal laws of late Western Han Dynasty. Emperor Guangwu also faced periodic minor battles with the Xiongnu to the north. Though there were no major wars with Xiongnu during his reign, because of raids by Xiongnu, Wuhuan, and Xianbei, the people suffered many casualties and fled to the south, leaving the northern commanderies largely unpopulated. In 46, many Xiyu (modern Xinjiang and former Soviet central Asia) kingdoms were suffering under the hegemony of one of the kingdoms, Shache (Yarkand). They petitioned Emperor Guangwu to again reestablish the Western Han post of the governor of Xiyu. Emperor Guangwu declined, stating that his empire did not have the military resources to protect Xiyu kingdoms, and the Xiyu kingdoms submitted to Xiongnu. Emperor Gengshi, Emperor Guangwu married his childhood sweetheart Yin Lihua. Later, in 24, while he was on his expedition north of the Yellow River, he entered into a political marriage with Guo Shengtong (郭聖通), the niece of a regional warlord, Liu Yang (劉楊) the Prince of Zhending. In 25, Guo bore him a son, Liu Jiang (劉疆). In 26, Emperor Guangwu wished to create Yin as an empress, but because she had not yet had a son, she declined endorsed Guo. Emperor Guangwu therefore created Guo empress and her son Prince Jiang crown prince. In 41, Guangwu deposed her and created Yin empress instead. He created Guo’s son Liu Fu (劉輔) the Prince of Zhongshan, and created Guo the Princess Dowager of Zhongshan. He made her brother Guo Kuang (郭況) an important official and, perhaps as a form of alimony, rewarded him with great wealth. Guangwu left Guo's son, Crown Prince Jiang, as crown prince, but realizing that his position was precarious, he repeatedly offered to step down. In 43, Emperor Guangwu agreed and created Liu Yang (劉陽), the oldest son of Empress Yin, crown prince instead, chaing his name to Zhuang (莊). Former Crown Prince Jiang was created the Prince of Donghai. In 47, a dispute over succession divided the Xiongnu, and they submitted to Guangwu and stopped waging war against Han. In 57, Emperor Guangwu died and was succeeded by Crown Prince Zhuang, who ascended the throne as Emperor Ming. 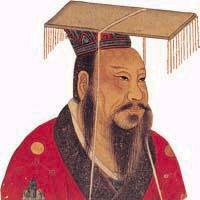 History of "Emperor Guangwu of Han"
This page was last modified on 16 January 2009, at 18:31.